It's 1967, and Junior High is a regular gauntlet for anyone who dares to cross the Queen, Saffron. She runs things with an iron fist and smug grin, making life miserable for anyone who doesn't meet her standards. Enter Cassia. She doesn't take well to bullies or the status quo, and quickly falls afoul of Saffron. But instead of knuckling under, Cassia plans revenge as this new, 18-part series gets off the ground as part of a Kickstarter from creators James Wright (words) and Jackie Crofts (pictures). 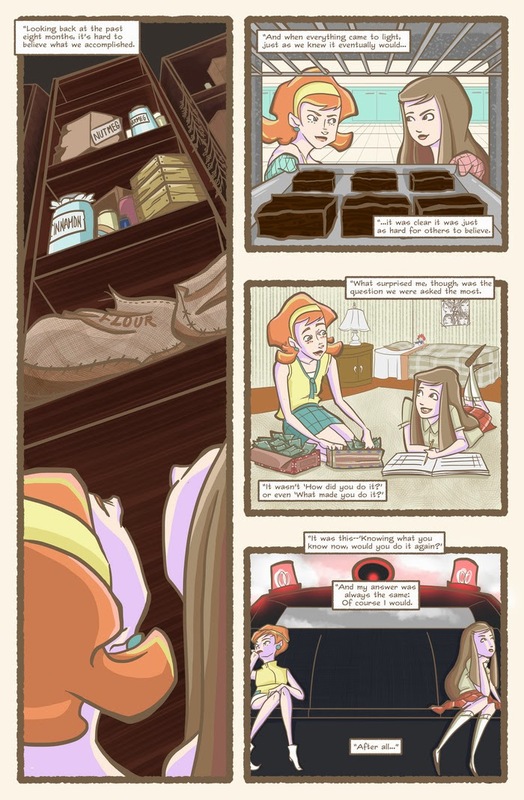 Page 1 of issue 1 of Nutmeg. It's a little hard to judge something based only on one issue, but I liked the quick-witted dialogue and really strong artwork that Wright and Crofts put together here. They aren't trying to Kickstart the entire series, merely the first issue to build up interest and then use that interest to keep the series going. It's a different approach from what we usually see in a Kickstarter, but I think it's a good one. The story and promotional information from the Kickstarter promise that this story is going to be a caper, with hijinks that end up leading to police involvement. (You can even see the siren lights in one of the first-page panels.) With two main characters who are interesting and engaging, I'm definitely hooked and interested in seeing what happens to Cassia and Pamela and if they can knock Saffron off her perch. This is a story about outsiders getting back at the cool kids, and I admit that those kinds of tales hold a lot of appeal to me. I also like that this story centers on the young women in the story. There's a boy who's sympathetic, but we don't see a lot of him, and it's clear the focus will be on the girls, always a welcome event. While the big publishers may have lightyears to go before they start playing fair with all genders, indie comics like Nutmeg more than make up for it. Crofts' art style really works for me, featuring characters with long, thin bodies that flow across the page. Everything is stretched out just a bit, giving it a distinctive look, even as heavy ink lines define the characters, not unlike the Archie house style. She also does a great job with the backgrounds, something that not all indie books get right. I was able to get a feel for the world of Nutmeg that goes past "generic school setting." The idea of an outsider getting revenge on a rich group of kids isn't new--Faith Erin Hicks' War at Ellsmere comes to mind, just thinking quickly--but I like the setup, and Wright's quick wit and smart dialogue keep this one fresh and interesting. That's something I hope keeps up in future issues. As I write this, Nutmeg is funded, but Kickstarters can always use additional help to grow stronger. If you like (or are looking for) comics with female protagonists, a sharp wit, and excellent artwork, then definitely considering giving Wight and Crofts some of your money. You'll be glad you did. You can find the Nutmeg Kickstarter here, or check them out at their website.